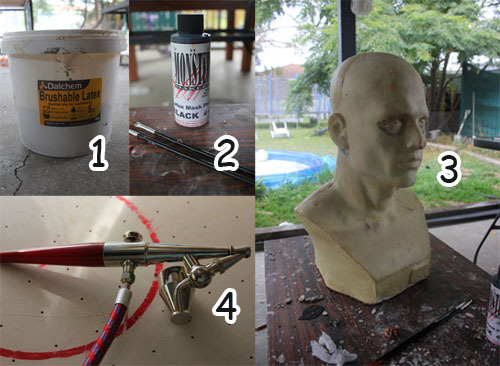 This tutorial will guide you through the steps involved in creating a full head latex mask from a two piece mould. I recommend reading the entire tutorial over a couple of times before you begin, so you have some foresight when completing each of the stages. You will need the materials listed below. Most of these can be obtained online. If you are unsure, please feel free to get in touch and I will help you source materials in your country. A life-sized Head bust, used as a base for creating your clay sculpt. (3)These can be purchased online, at some craft stores, or carved yourself out of a large rock (ha!). Oil based clay. Oil based clay doesn't dry out and is used to,sculpt the form of your mask. Weight? Water based clay. Used to create a "dam wall" when creating the mould. Oil based clay can also be used. Plaster or Ultracal 30. Either standard plaster of paris or ultracal30 is used to create the mould itself. Ultracal30 is stronger and captures finer detail than standard plaster, however can be a little more expensive and may be harder to obtain. Plaster is used in this tutorial. A small tub of Vaseline for use as a release agent. Latex-based paints (2). Standard paints generally do not stretch and will crack and flake off your mask, a latex-based paint is required. An airbrush setup (4) is optional. A somewhat expensive investment, but allows much greater realism when painting masks. You will need an "external mix" airbrush (the "Paasche H" type shown here is standard) as internal mix airbrushes clog up when used with latex paint. You will also need cheap paint brushes, popsicle sticks, a bucket, scissors, a hammer and chisel, some lengths of fabric, and one or two people to help! 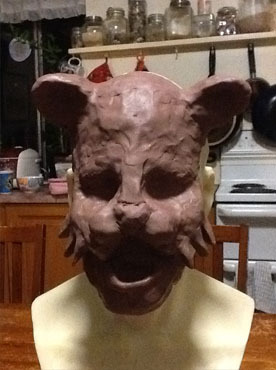 The mask is first created as a clay sculpt. The head armature needs to be covered entirely with oil based clay, over which details and features are sculpted. Clay can be smoothed and detailed using many items found around the house, spoons, skewers etc. Experimentation is key! Oil based clay won't dry out, so you can take as long as you need. Start with low detail, layout out the basic, broader forms. Details (such as skin wrinkles) come last. To create a two piece mould, a dam wall is then formed around the outside middle edge of the mask. For this you can use water or oil based clay. It needs to hold the weight of plaster so ensure the clay adheres to the sculpt all the way around and is at least 2.5cm (1 inch) wide. Plaster will cover the mask up to this wall so you need to position this wall so that the plaster can be removed later. It is important to make sure the plaster will not stop the rigid armature beneath the sculpt from being able to be removed later on. In most cases, a wall is created along the centerline of the head, over the ears. For this mask we are starting with the front of the face, so the dam wall needs to have a clean join along the front edge. The rear of the wall does not matter and can be pressed as needed to reinforce the wall. "keys" are added to the dam wall. These are used to align the mould halves later. Keys need to be a simple half circle, added to the dam wall. Remember our two rigid mould halves need to slot into place later on, so avoid edges that will "catch". No valleys in your key shape! With our dam wall in place we begin adding plaster over our sculpt, starting with a "beauty coat" which is painted over the mask with a brush. The aim of a beauty coat is to capture all of the details. Try to avoid air bubbles at this stage and ensure all surfaces are covered. Plaster is best mixed with water until it has the consistency of slightly thick pancake batter. If you have not used plaster before I recommend mixing a very small amount and playing with it to see how it mixes and cures hard. As the plaster cures continue layering the plaster. If you are able to tilt the bust to accommodate the underside of detailed areas this can be helpful, as it can be difficult at first to get the plaster to "take" on the undersides of the features. A minimum of 2-3 beauty coats is a good idea at this stage. Continue building up the plaster up to the wall edge, after your beauty coats this can be applied generously using a thicker mix of plaster. The entire mould should be at least 4cm (1 1/2 inches) thick across the entire face and up to the dam wall. The thicker you make this the stronger your mould will be, too thin and you can crack the mould when removing it from the bust. A couple of helpers always comes in handy! Here my sons build up the mould while I take photos. When the plaster has completely cured, the dam wall is removed. A thin layer of vaseline is run along the edge where the dam wall has been removed. This will help the two halves of the mould come apart later on. With Vaseline applied, we create the rear side of the mould in the same fashion, remembering these halves will be separated later on, so avoiding too much plaster going over the Vaseline edge. With the rear mould created this is now left for 24 hours to completely cure. Separating the mould should be done with care, ensuring a light force at first and gradually building the amount of force applied. To separate the mould, lightly tap into it using a hammer and chisel. Tap the chisel at various points around the edge to ensure the pressure applied is being evenly distributed. You will start to see a crack forming between the two mould halves. Take your time. Pull the mask halves apart, remembering to apply pressure at various pounts to avoid cracking the mould. Once the mould halves have been separated we can remove the clay . A popsicle stick cut is great for scraping out small areas. A metal object (such as a spoon) is too hard and can crack the plaster. If the clay is too hard it can be softened with a heater or hair dryer. This takes time and is a bit of a pain, but the end is now in sight! With the clay removed, we now run another layer of Vaseline along the edges where the mould halves meet, this simply helps stop our liquid latex from leaking out of the mould in our next step. To capture as much detail as possible, quickly brush into the details with out liquid latex beauty coat..
..then before this dries we tightly bind our halves together using mask straps or strong, stretchy fabric tied around the mould, and the latex is then poured into the mould and allowed to sit for ten minutes. If you don't have enough latex to fill the entire mould you can tilt and turn the mould around during this time to ensure all edges are coated to a suitable thickness. The excess latex is then poured back out..
Now comes the exciting part! The mould halves are untied and the latex mask is gently peeled out. The mould can now be cleaned and "seamed" around any rough areas. Excess latex is cut off with scissors. For this mask the eyes, mouth, and ears were also cut out. Finally, the mask is painted with latex-based paint, starting with low detail and finishing with finer lines. An airbrush is useful for creating shades and details. An undercoat is generally applied first, followed by details over the top. Here is our finished mask. If you have a go yourself, please share your work with us! Any questions or comments ask below or join us on our Facebook page.